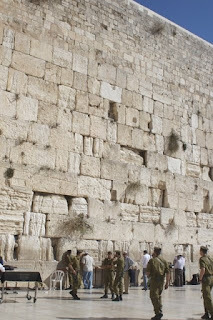 We had one day after the Lion’s Conference with Faye before she left Israel – possibly for the last time. 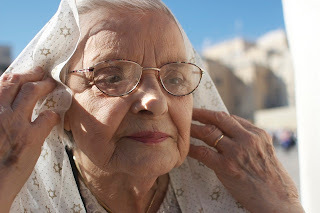 She wanted to go to the Wall in Jerusalem, so we hired a car and took her there for one last adventure before she left. We got to the Wall and Jan Greenfield (our Israeli staff person) and she covered the heads in scarves and to me they suddenly looked related. Faye talked about being here 15 years ago with her husband, before he died, and how much going to Israel, especially Jerusalem, meant to her. 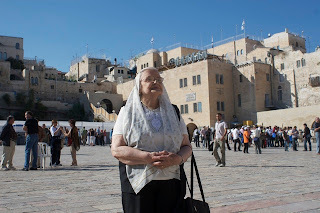 Throughout the entire day trip she marveled how Israel has changed with so many more buildings and people. 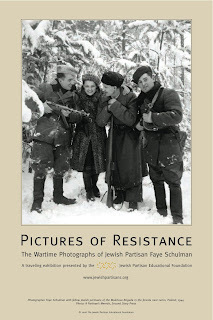 As we walked the streets I heard a couple people stop and point to Faye saying, “That’s the Jewish partisan photographer.” She had become famous. On the way back to Tel Aviv and the airport, we stopped her at the Jewish partisan memorial. 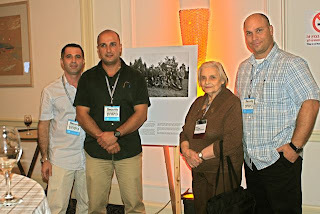 The Israeli soldiers there were honored to meet Faye and wanted to pose with her in a picture. Her trip here was amazing on so many levels. 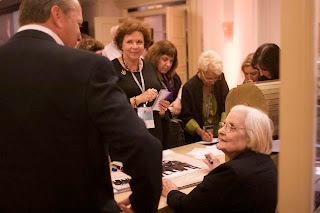 She touched over a thousand people at the Lion’s conference and made many friends for JPEF. 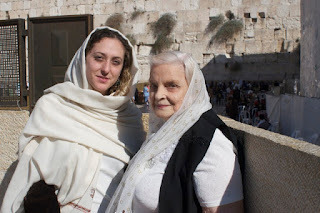 I am humbled how this woman, turning 90 later this week, did this to help us tell her story, and the story of all Jewish partisans. 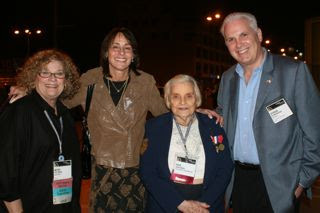 Faye with Tzipi Livini and the Governor of Michigan! What a Week! 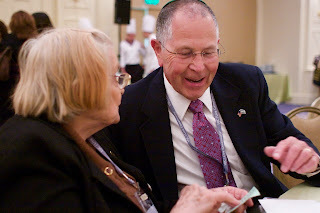 Jan Greenfield, our Israeli staff person and myself connected with hundreds of people personally throughout the conference and at our table, which was a constant hub of activity. We had three phenomenal events that put us over the top. First, there was our workshop. We were told that because of the timing (Saturday at 2:15pm) with many people out for Shabbat, we might only get 5-10 people. 130 showed up! We had to bring in more chairs—twice. People were turned away at the door. Faye had the whole room hanging on her every word. 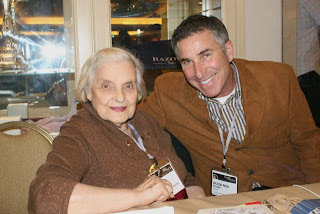 Next we had a private reception at the hotel room of Diane and Howard Wohl for a dozen of her friends. 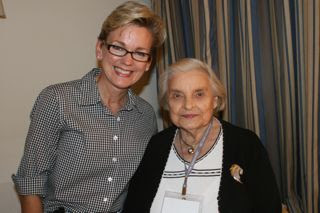 Just as we started the governor of Michigan, Jennifer M. Granholm, came in to hear what Faye had to say. On meeting the governor again in the elevator she thanked me for introducing her to Faye, and took some material. Looks like we have a good shot to get into their schools now as well. 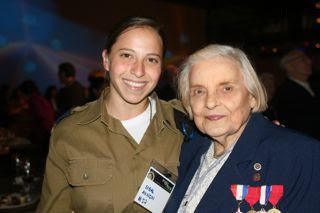 With barely an hour for Faye to rest, we then took a taxi to the Port of Tel Aviv to the exclusive Hanger 11, where the evening’s event was taking place—a gala dinner with 1,400 people – honoring women soldiers of Israel. Faye had to rehearse with the event director and their staff before the guests came. 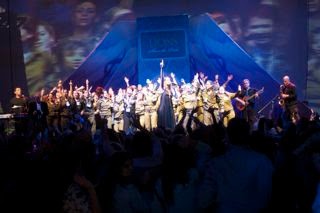 The opening ceremony included young Israeli folk dancers who got the whole Lions crown on their feet. 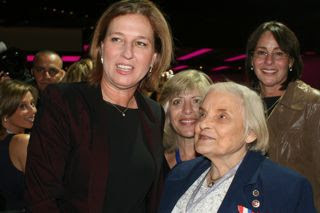 The keynote speaker was Tzipi Livni, sitting at the next table. When Livni arrived it was a media event with dozens of cameras and her security detail. One of the only requests for the whole week Faye made of me was to get a photo of her with the foreign minister. It took some pushing through the crowd, but we got it. 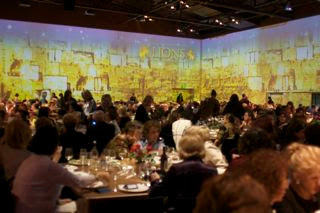 When it was Faye’s turn to speak, she was introduced with her photographs projected on the walls around the 140 tables. The visuals were spectacular. In her speech, she insisted she thank JPEF and me personally (I tried to dissuade her on the latter) for all the work we do—people clapped. 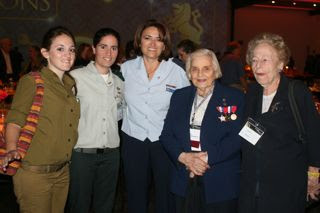 When she was finished speaking Brigadier General Yehudit Grisaro came up with another woman soldier from the IDF and Faye literally passed the torch to the general, who passed it to young soldier. They held hands and the entire audience shot up giving them a loud and long-standing ovation. 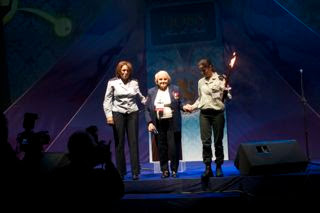 After the dinner there was dancing and Einat Sharuf, a well known Israeli singer, performed. People took this opportunity to get a photo with Faye or speak with her. 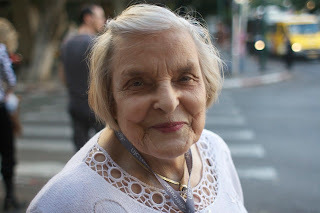 She touched many lives this week. (More photos on our Flickr account soon to follow). Yesterday was our first full day at Lion Conference. In the morning I worked on Faye’s closing night speech with her for two hours—she needed to put it in her own words vs what we wrote for her. The end product was much better. I had to convince her that Barack Obama and John McCain have speechwriters, and it is OK for her to have them as well. We set up in the ballroom area of the Tel Aviv Intercontinental. 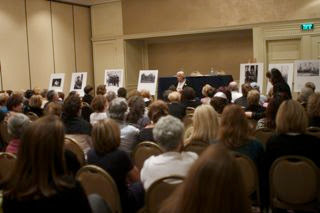 The ILOJC staff gave us a fantastic location and we put the mini-exhibit of her images around the room. 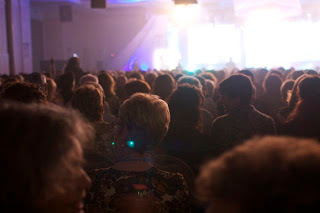 The 1,100 attendees gathered in the room for a pre-dinner mixer before the opening plenary and dinner in the same area. We met a lot of supporters of JPEF there including Rick and Claudia Felson, Diane Wohl, and Ann Bear. Rick, who’s dad was a partisan took a special liking to Faye (and she to him). Rick tried to convince her to come to San Francisco when we open her exhibit at Berkeley Hillel/Lerhaus in March --I think he might have been successful! By the end of the evening, there was a line of 15 people by our table, all wanting autographed Faye posters and to talk with her. We made great connections with people from at least 15 different communities across the country who are very eager to bring the exhibit and JPEF to their community including Phoenix, St. Paul, Orange County, Palm Beach, Albuquerque, Chicago, and Houston. We did not leave the hotel until 10:30pm. Faye had a long day and we decided she would take the next day off –especially as it started at 8 am for her back in the same ballrooms. Faye was impressed by the lack of security on the conference until I showed her the many men with ear pieces around the hotel. They were thrilled to meet her and hear of her experiences. Faye wanted a photo with them. Here are a few more photos for yesterday as well. The one with the stage and lights was the opening ceremony which incredible production values -- Israeli singers and dancers with explosions of confetti. Faye also saw that many of the speakers were reading from prepared remarks like she will on Saturday night, making her feel much better about the process. It was a incredibly short trip from SFO to Tel Aviv, with a stop in New York to "unload" my wonderful four year old daughter with her grandparents for 10 days, as my wife Maggie has to work a major event AND watch our 18 month old son. Arrived and the weather was gorgeous as is the country. My wool overcoat from New York was quickly set aside as I gathered a box with 8 large of Faye Schulman's photographs, two heavy bags of JPEF literature and headed to the hotel. Traffic from airport to hotel was very slow. Felt like a commute from Berkeley to San Francisco on a bad traffic day. Too bad the country is getting so crowded here. Got to hotel across from beautiful Mediterranean and beach and none of that mattered. Did walk through with International Lion of Judah staff, Jan Greenfield from JPEF, and Faye. Faye continues to be so enthusiastic about being in Israel--the first time in 15 years and the fisrt time since her husband passed away. 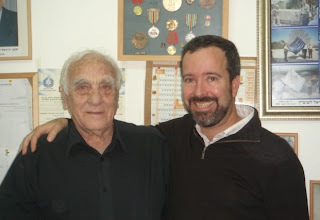 In afternoon went to Jewish Partisan Organization in Tel Aviv and met with their ED, Baruch Shub who is a former partisan and is helping us bring women partisans to the Lion closing ceremony Saturday night where Tzipi Livni and Faye Schulman are both addressing the crowd of 1,400. Baruch and his staff use our website all the time and were also impressed with Defiance website and trailer (they did not yet hear of film). 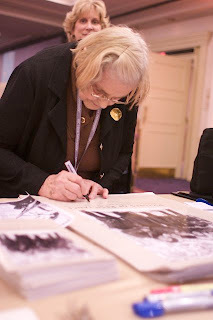 Have meet many people VERY interested in bring Faye from places including Texas and Massachusetts. Going to explore the Tel Aviv evening as a nap I took during the day has rendered me pretty much awake at 9:40 pm Israel time. More later and photos as I experiment with my first blog.